Sweet, i live in a town near Fairbanks. I should go check whatever it is your doing out. Exciting!!! I think Mr Stuffins 1 and The Muppets : Robin Hood are both in the Feb Previews too - FEB09 4133 and Feb 09 4143. I'm soooo glad you'll be going to Heroes Con. I'll try my darndest to get on your commission list. So, I was thinking could you or a guest artist do a daily strip of say even another group of guard mice. I am not sure I can, continue to go on without some daily dose of mousy goodness. Nice seeing you again at the convention. I posted my sketches on my blog and of course yours is there. 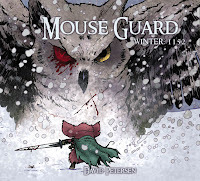 My son Noah loves Mouse Guard! He just read his first one (about 5 times) and he can't wait to read more.